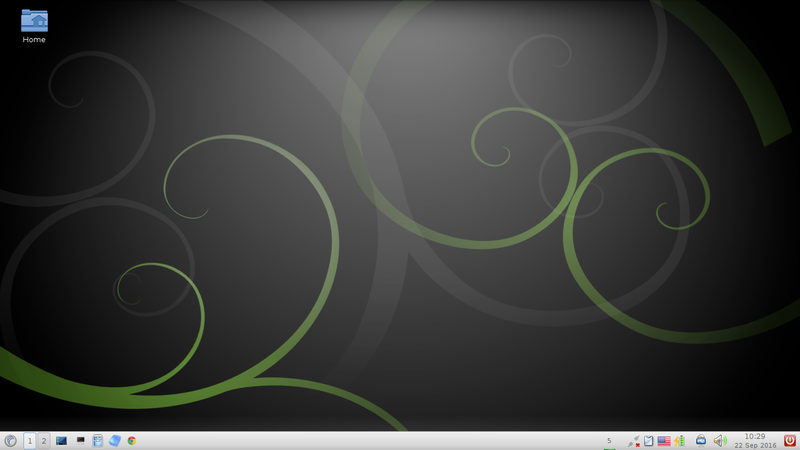 Porteus was recommended to me recently as a Linux distribution that I should review. 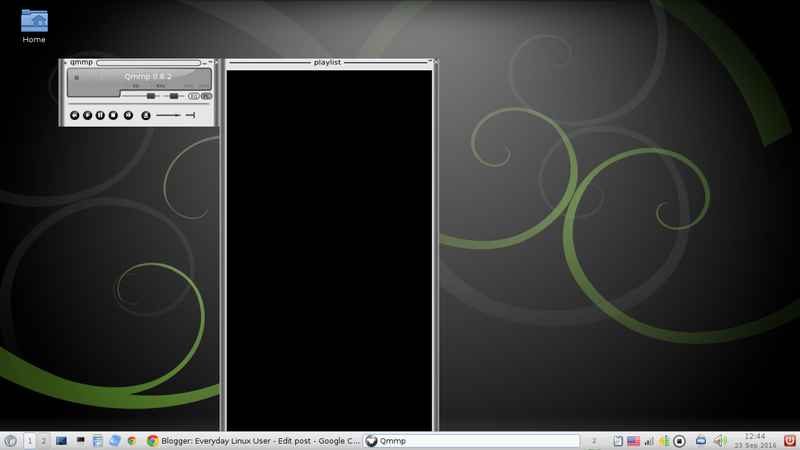 For those of you that are unaware, Porteus is a portable Linux distribution designed to be run from a USB drive much like Puppy Linux or Knoppix. 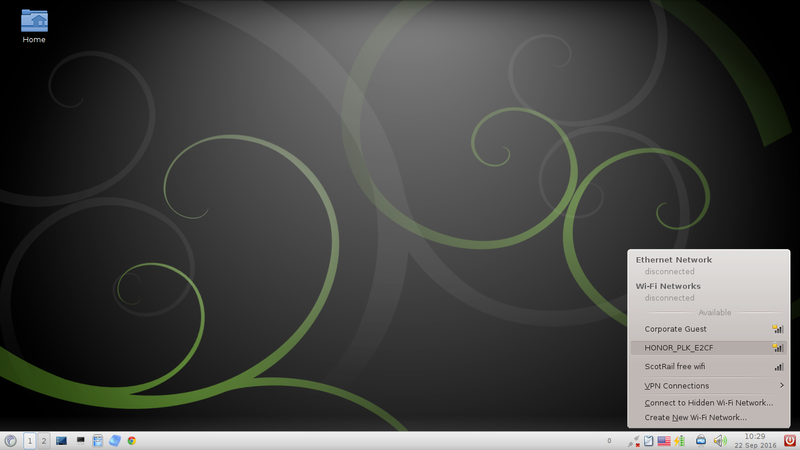 Porteus is a complete linux operating system that is optimized to run from CD, USB flash drive, hard drive, or other bootable storage media. It’s small (under 300Mb) and insanely fast which allows you to start up and get online while most other operating systems are left spitting dust. Porteus comes in both 32 & 64 bit and aims to keep on the bleeding edge. I normally spend a week reviewing a distribution but for reasons that become clear I haven’t taken so long on this one. There are some things I really quite liked about Porteus but there are some things that frustrated me. So without further ado lets get on with the review. The first thing to note is that you don’t get the normal download link. Instead you get to customise before you begin. This is actually a really good idea. For instance you can choose between 32-bit and 64-bit, whether you require the EFI bootloader or not, whether you want to boot to a graphical desktop and you can also choose the desktop you wish to use from one of KDE, Gnome, XFCE and LXQT. Also on the page you choose the timezone, keyboard layout and for some reason the volume level. Another thing you can do is choose default software selections. For instance you can choose to install Chrome, FireFox or the Opera web browser. You can also choose your word processor, whether to install Skype or not and whether to include development tools. There is a drivers section so that you can choose the one for your specific graphics card. You can also decide whether to install printing support. The selection mechanism is nice and easy to understand. Point and click. So far so good. The Porteus website provides 2 methods for creating a USB drive if you are using Windows. There is a download button at the bottom of the page. Be careful because it always looks like the download button is at the top of the page but that button actually installs the software for an advertised product. After Universal USB Installer has downloaded you just double click on the file to start the program. The initial step is accept the license agreement. When the main screen appears choose Porteus from the drop down list in step 1 and then click the browse button and locate the downloaded Porteus ISO file. Finally select the drive letter for the USB drive and click Create. 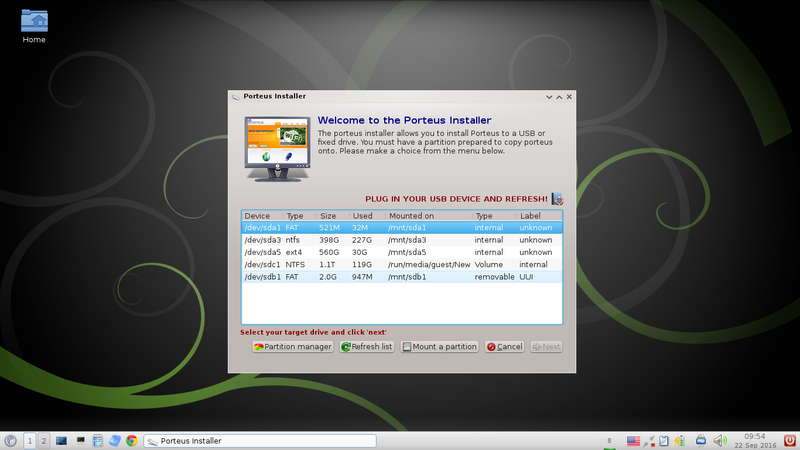 The other way to install Porteus to a USB drive works for both Windows and Linux. Simply mount the ISO. You can usually open an ISO in Windows explorer if you are using Windows 7 upwards. In most Linux distributions you can mount an ISO using an archive manager. With the ISO mounted Extract the files from the ISO straight to the USB drive. Finally navigate to the boot folder and double click on either the Windows installer or Linux installer file. Remember that Porteus is designed to run from a USB drive so there is no actual installation to hard drive required. If you are running Linux from a USB drive then you will need some way of persisting changes that you make. In Porteus this is achieved by creating a save file. To create a save file you boot into Porteus and then from the settings menu there is a save file creation tool. When you select the menu option you are asked for the root password. What? When did I set a root password? I didn’t. So what is the root password? I had to go to Google to find out. There is an faq page which has various topics such as how do I change the root password. It is this page that shows you the default root password. Maybe it would be good to add the topic “what is the default root password?”. The save file wizard is fairly straight forward. You can create a new file, resize an existing save file, encrypt a save file or recover a broken save file. Upon clicking on the new save file link you are asked to name the file, choose a file size and choose the file location. Under advanced it defaults the file system as xfs but you can also choose ext4. When you click OK the save file will be created. Be patient because it takes a few minutes. 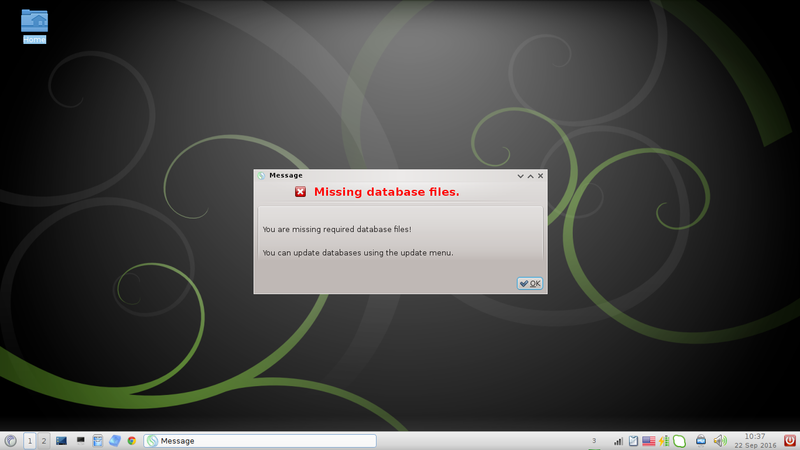 After the installation has completed a message will appear with the name and path of your saved file. Rather curiously it says you need to edit porteus.cfg and it says you will need to change a line but it doesn’t say which line you need to edit and this is where the frustrations really begin. There is a page on the Porteus website which goes into great details about how to create a save file. The page even tells you which lines to edit in the porteus.cfg file. 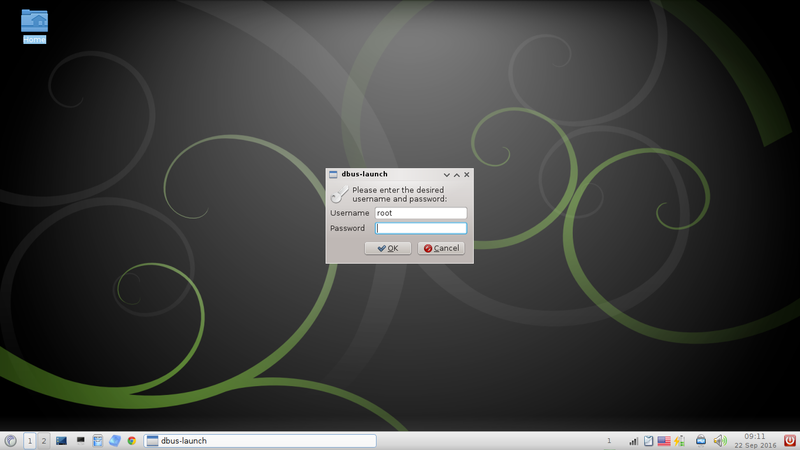 MENU LABEL Graphics mode (KDE). 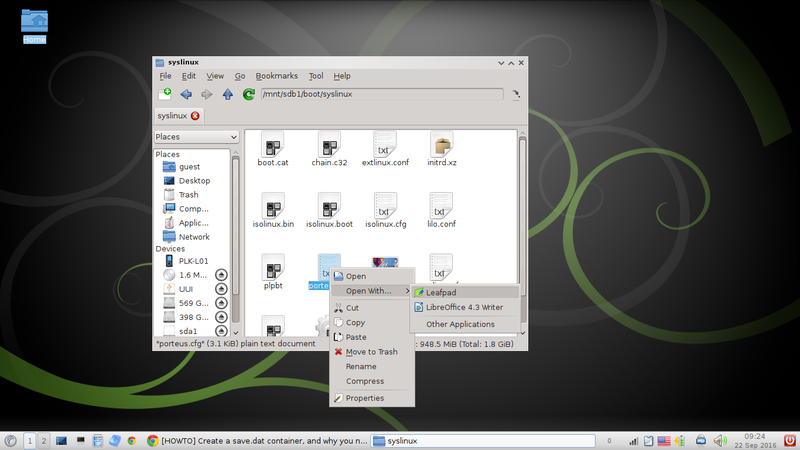 MENU LABEL Graphics mode (LXDE). Run Porteus the same as above. All you have to do is amend the bits that say changes= to changes=/porteus/porteussave.dat (or whatever you called the file and wherever you saved it). I did this, changed the wallpaper and rebooted the computer. I chose the option to boot Porteus again and my wallpaper was back to the default. I tried various things to get the save file to work and then I realised that if I booted in non EFI mode then the save file would be correctly used to save changes but if I used EFI mode then it always loaded without the save file. As you can see the file the web page tells you to edit is in the syslinux folder which is great for a standard BIOS. However the file you need to edit for EFI is in the /boot/EFI folder and it is called refind.cfg. The reason is that to run in EFI mode Porteus uses Refind as the boot loader. In the refind.cfg you will find a changes= line. Simply add the path to your save file to this line and it will start working. Rather frustratingly the Porteus website uses this reason for not automatically updating the config files when you create the save file. While it would be fairly simple to have Porteus automatically create a save.dat file container on the same drive as your Porteus install and update your porteus.cfg to point to it, doing so would keep our users from fully understanding the flexibility and the array of options that are available for storing their changes. Manually creating a .dat container allows you to fully customize the name, location and size of your container. Also, if you look at the documentation in /boot/docs/cheatcodes.txt, there are numerous options for implementing the ‘changes=’ cheatcode; you can point it to a folder or subfolder (on a linux filesystem) or a container file (on any filesystem), on any writeable device accessible by your system (or just point it to the root of the device, and it will create a ‘changes’ folder in the root of the device, provided it is has a linux filesystem), and you can reference the path by device name, device label, device UUID, or without referencing the device at all, to have Porteus search for the location on the same drive as your install. 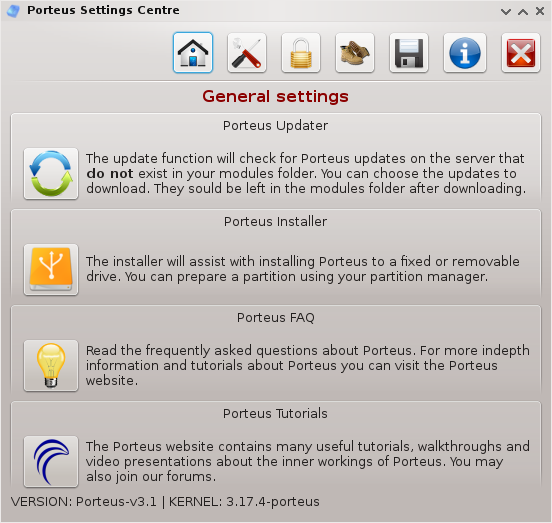 With these options, you can put your changes on a separate partition from your Porteus install if you want to, and you can have multiple installations of Porteus with their changes saved to different locations, and your data will be found and mounted, even if you use Porteus on machines with different hardware configurations. Container files can also be created for use with “magic folders”, to save the contents of individual directories in your live filesystem to a container (or multiple containers). We believe that encouraging users to read, experiment, and learn will help them find a solution that works the best for their particular situation, as one size certainly does not fit all. If you couldn’t be bothered to read all that then the reason appears to be so that users don’t ignore all the potential cheats and secret options they have available to them. They want users to think about what they are doing and how they will use Porteus. All well and good but I spent a fair amount of time trying to work out why my save file wasn’t working before I found the refind.cfg. Most users won’t care about the extra options and those that do will go looking for them anyway. You can of course install Porteus to the hard drive although this isn’t the way Porteus was designed to be run. 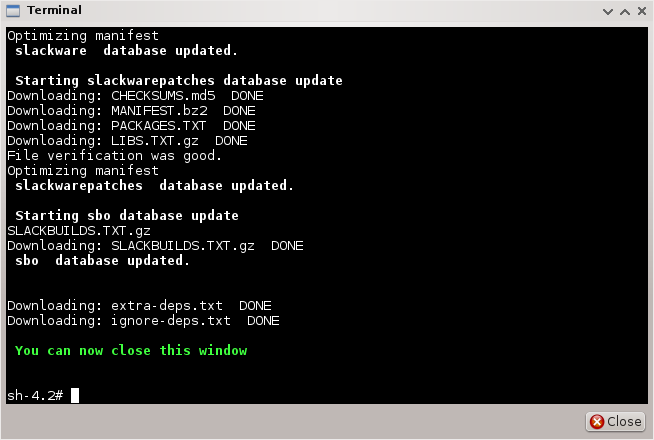 A list of potential partitions are displayed when you first run the installer. It is fairly tricky to install Porteus however, especially if you have EFI and to be honest I gave up. If you choose a partition and click install then it will only use free space on that partition. Porteus expects you to create the partition it is to be installed to. Porteus will install a bootloader to the drive but the bootloader will only have Porteus in the boot list. Therefore this isn’t a good solution for dual booting. It also doesn’t work very well for EFI based systems. Believe me I tried. I don’t think I have ever spent so much of a review looking at the set up before. It was a fairly involved experience. Porteus itself actually looks pretty good when you first start using it. You have the browser you decided at the installation stage so you know that is good and the boot time was exceptionally good. Connecting to the internet is straight forward. Simply click on the network icon and choose the wireless network you wish to connect to and then enter the security key. The browser is the one you chose during the installation phase so in my case I have Chrome. I also chose LibreOffice so that is installed as well and Skype is also available and working. There really isn’t much else to talk about when it comes to applications because there aren’t many applications installed. Sure there is an image viewer, messenger and a bittorrent client. There is also the qmmp audio player which I have to say has me baffled. The QMMP wikipedia page says that QMMP has an intuitive easy to use interface. Really? I’m quite an intelligent guy but I can’t find one single menu option that allows you to choose how to open a track or import music. You can find the files in a file manager and choose to enqueue them in QMMP but physically using QMMP to open files is really not intuitive at all. 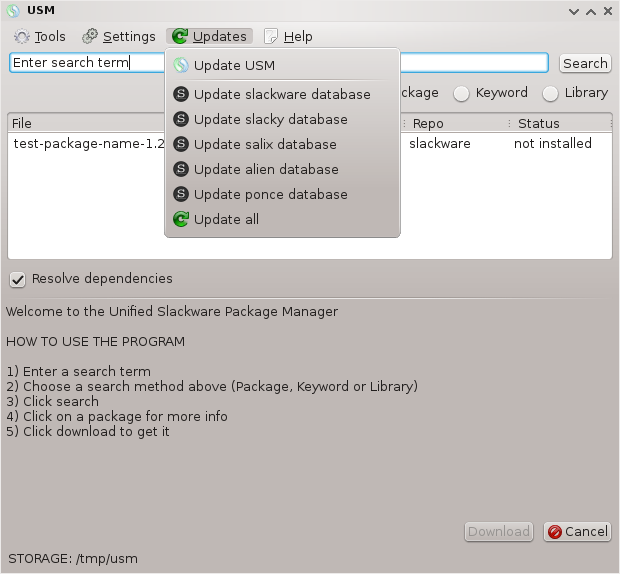 To install applications you have to use the Unified Slackware Package Manager. When you first start the application it complains that updates are required. Actually installing software is a bit of an issue though. For example finding applications is a bit of a nightmare. The first application I searched for was Steam and that isn’t there. Not the biggest deal because this is a pen drive version of Linux and who plays Steam games from a pen drive? How about a different audio player then. I searched for Rhythmbox, no, not there. I searched for Banshee and again not there. I searched for Quod Libet (something a little more lightweight) and at last it was there. So I installed Quod Libet which simply downloads the Quod Libet tarball and dependant tarballs. I navigated to the folder where the tarballs were downloaded and upon right clicking them there is an option to install them. (Which I guess means extract them). You can also use the installation tool to select the files and packages to be installed but it isn’t really any easier. When I ran Quod Libet nothing happened so I ran it from the command line and it complained that python-gi was missing. I searched the installer for the missing package and it doesn’t exist. I think the average person is going to find installing software in Porteus frustrating and difficult. When I was selecting the download options for Porteus I selected the UK as the keyboard layout but the keyboard layout has defaulted to US. There is a tool for selecting the keyboard layout in the toolbar. However when I chose the available UK option and pressed the button to move it to active it wouldn’t work until I removed one of the other layouts. I couldn’t get this to work at all with my printer. I tried to connect to my WD My Cloud device but this was a no go. Porteus has a settings application which allows you to do things like update it and run the installer. There are also options for FAQ and tutorials. I tried both these links and they didn’t work. 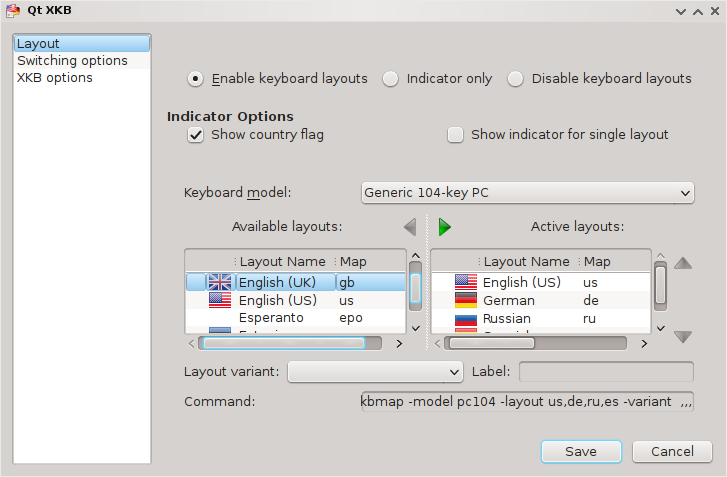 You can also run a language setup tool, timezone config tool, keyboard layout tool and sound settings tool. Incidentally the keyboard layout tool here works better than the one in the system tray. Under security settings you can set up a firewall and change the user password. There are also boot setup options such as showing a list of cheat codes and you can also setup a command to run when Porteus first boots up. You can also manage save files. Ok, so this is the way I see it. Porteus is fine as a USB based distribution if you just want to use a web browser and maybe type a document. For everything else it is just too difficult and for no real reward. For instance I could create a Xubuntu or Lubuntu persistent USB drive and all the hardware stuff would work out of the box and I would have access to the full software repositories. With Porteus it feels like you are fighting it and if something is difficult to master then it needs to provide some reward for the effort such as having something so cool that you go wow. Yes it is small at around the 300 megabytes mark and it boots quickly. The download screen is a good idea and whilst the idea of save files isn’t new (Puppy does it, as do persistent *buntu distributions) the concept is a decent one. The fact that you have to mess around with configuration files to get it to work and the fact that there is a concept of cheat codes and the fact that finding and installing software is so convoluted just makes it too much effort. Yes it's true what you say. I'm currently using Mint (xfce/32bit)as my "carry-around-on-USB-thingy", but might give Porteus a go next time. About QMMP, that interface yousaw used to be very common once. It's the Winamp interface. Besides that, QMMP also has a non-skinned standard interface which is quite easy to operate. I'm staying with Xubuntu. It just works. Good review, I think to be able to enjoy Porteus and use it for more than just browsing or as a rescue system one will have to have some experience of how Slackware and its offshoots work. I'm sure there was a way to pull that missing library from Slackbuilds or another repo (several are set in USM) but it's not as straight forward as many and one could say why would I bother? QMMP behaves in the same way as daddy XMMP, BMP, or Audacious, or for that matter as already pointed out, Winamp. Great review.I wish I had read it before I tried Porteus.I hope someone will make a similar system based on Arch or Debian.